According to Krista, this was the schedule for every student at Woodlawn, and the afternoon announcements were either right before or right after the final bell at 2:15 P.M. So, what does this schedule tell us about the statements and testimony of Debbie? About two months later, on March 26, 1999, Debbie gave a second statement to Detectives Ritz and MacGillivary. 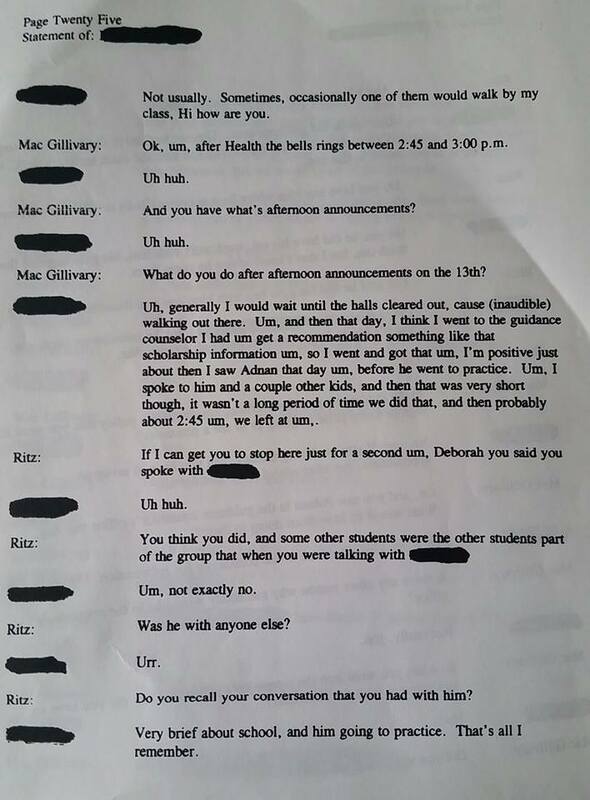 That statement had two important components: (1) Debbie said that she saw Adnan outside the guidance counselor's office on January 13th at about 2:45 "before he went to [track] practice;" and (2) Debbie said that she saw Hae in the lobby area of the school on January 13th between 2:45 and 3:15 before Hae left to pick up her cousin and go to a sporting event "at another school not at Woodlawn." It's tough to say when the authorities started to doubt or at least deemphasize Debbie's story. Three days before Debbie's second police statement, Inez Butler-Hendricks had given a statement in which she said that she saw Hae on January 13th soon after the end of school at 2:15, with Hae leaving school in a hurry to pick up her cousin. For whatever reason, the State eventually decided to proffer Inez as the last person to see Hae alive, which is what led the prosecution to argue in its opening statement of Adnan's first trial that the 2:36 call on Adnan's call log was Adnan calling Jay to meet him at Best Buy. One of the more obvious problems with this narrative was Debbie. Debbie testified as a witness for the prosecution at Adnan's first trial on December 13, 1999. During direct examination, the prosecutor had Debbie read from Hae's diary and describe the relationship between Adnan and Hae; understandably, the prosecutor did not ask Debbie about either of her prior statements given that they contradicted the State's timeline. This is the last question defense counsel asked Debbie, and the prosecutor followed up with one question on re-direct examination, in which he asked Debbie whether it was easy to skip out of a class or classes at Woodlawn. It's difficult to understate the importance of Debbie's testimony had Adnan's first trial reached a jury verdict. The prosecution was trying to sell the notion that Hae was dead by 2:36, and yet they had a witness for the prosecution making a police statement that she saw Adnan at school at about 2:45 and confirming that she remembered making the statement at trial. Again, it is difficult to understate the importance of Debbie's inability to recall her prior statement at the second trial. With Debbie removed from the timeline, the State could again claim during its closing argument that Hae was dead by 2:36, when Adnan supposedly called Jay from the Best Buy. Conversely, if Debbie had stood by her police statement, the prosecution would have needed to (1) claim that the Best Buy call was later, possibly the 3:15 call on Adnan's call log; or (2) sell the jury the 2:36 timeline despite one of its own witnesses consistently saying that she saw Adnan at school at about 2:45. Given that Debbie didn't stand by her police statement(s) at trial, it would be easy to discount them as a source of information regarding the death of Hae Min Lee. That said, unless you think that Debbie was wholly making up her statements out of cloth, she likely did see Adnan and Hae after school some day in January 1999. So, which day was it, and when did she see them? Comparing Debbie statement to the Woodlawn schedule from 1998-1999, we see an obvious problem. According to the schedule and Krista, school ended for every student at 2:15, which is when the afternoon announcements played. And yet, in her second interview, Debbie answers in the affirmative when asked whether the bell for her Period 4 Health class rang between 2:45 and 3:00. Debbie then responds that, after the afternoon announcements played, she waited for the halls to clear before going to the guidance counselor's office, which is where she saw Adnan at about 2:45. It's always difficult to make assumptions, but one fair assumption from Debbie's statement is that she might have been confused about when school ended, thinking that school ended at 2:45. If school ended at 2:45 and Debbie saw Adnan at the guidance counselor's office after the halls cleared, this would place their interaction at "about 2:45." Given that school actually ended at 2:15, this might mean that Debbie in fact saw Adnan at the guidance counselor's officer at "about 2:15." The interesting thing about this amended timeline is that it could corroborate Becky's police statement. In her police statement, Becky says that Aisha and she were walking to the guidance counselor's office at about 2:20 when Adnan and Hae walked past each other on opposite sides of the hallway, with Hae telling Adnan that she couldn't give him a ride because she had "something else to do." Was it possible that Adnan had just seen or was just about to see Debbie at the guidance counselor's office? 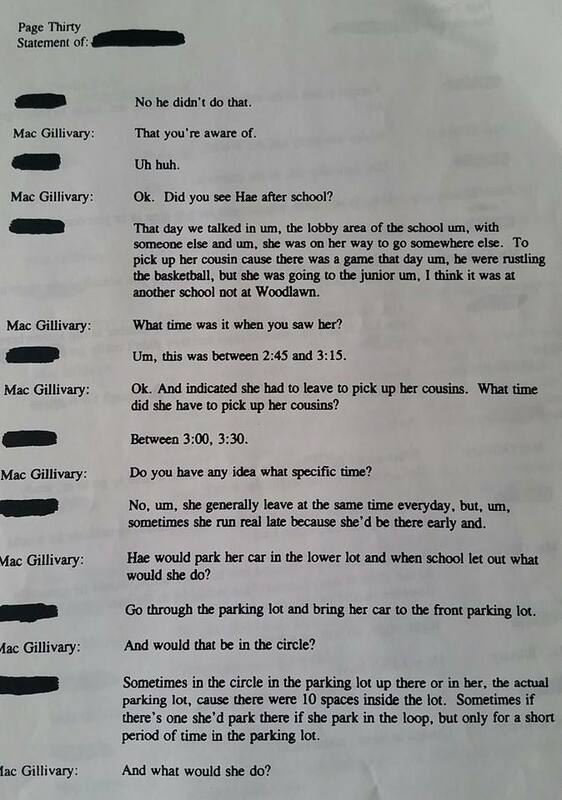 Were Becky and/or Aisha among the "couple of other kids" whom Debbie saw at the guidance counselor's office? We do know that Adnan picked up a letter of recommendation from the guidance counselor on January 13, 1999. A notation by defense counsel indicates that the guidance counselor printed off this letter for Adnan at 1:13 P.M., but it's possible that (1) defense counsel mistook the date of the letter -- 1/13 -- for the time it was printed; or (2) Adnan made two trips to the guidance counselor's office on January 13th. So, if Debbie really saw Adnan at "about 2:15" on January 13th, when did she really see Hae? Does the 2:45-3:15 time frame from Debbie's second police statement become 2:15-2:45? Does the 3:00 time listed in Debbie's first police statement become 2:30? Or is Debbie's recollection of seeing Hae less tied to the end of school and more tied to Hae being about to leave school to see Don at the mall and/or pick up her cousin and/or attend a sporting event? It's tough to say, and it's also tough to say whether Debbie in fact is remembering the correct day. After all, Susan Simpson has pretty convincingly argued that there was no Woodlawn wrestling match on January 13, 1999, and Don himself has said that he had no plans to see Hae until after her work shift ended at 10:00 P.M. So, if Debbie didn't in fact see Adnan and/or Hae after school on January 13, 1999, when did she see them? It's certainly possible that Debbie is conflating a few separate days, but it seems likely that Debbie is remembering a single day when she saw both Adnan and Hae after school. As with Asia, assuming that this day was in January 1999 before Hae disappeared, there are four other options: the two days Adnan was in school from 1/4-1/7 (1/8 was a snow day, and Adnan was absent two days the first week back from school), Monday, January 11th, and Tuesday, January 12th. As Susan Simpson has noted, there was a Woodlawn wrestling match on January 12, 1999. That said, there was no track practice on January 12, 1999 because Woodlawn had a track meet that day. Unless Woodlawn had wrestling matches on back to back days, it is unlikely that Debbie was thinking of January 11th (or, of course, January 13th). That leaves us with the two days that Adnan was in school the prior week. We know from Susan Simpson that Woodlawn had a wrestling match at Randallstown on January 5, 1999. Unless Woodlawn had two away wrestling matches from January 4-7, 1999, this was the only away wrestling match Woodlawn had in the first week back from school. We also know three other things: (1) Don was working at the Owings Mill Mall on January 5, 1999; (2) Hae made two purchases at the Owings Mill Mall on January 5, 1999; and (3) Hae's note to Don mentioned having to go to a wrestling match at Randallstown. Assuming that January 5, 1999 was a day when Adnan went to track practice and Hae picked up her cousin, it would work as the day that Debbie was remembering. Furthermore, if we believe that the undelivered note combined with Hae's credit charges on January 5th are indicative of Hae skipping the Randallstown wrestling match and seeing Don at the mall, that day also works as the day when Hae apparently stood up Summer at at an away wrestling match (which Summer remembers as the Randallstown wrestling match). Or Debbie was remembering another day. Or Debbie was remembering January 13th but attributed the wrong times for seeing Adnan and Hae. Or maybe Debbie really did see Adnan at about 2:45 and Hae between 2:45 and 3:15 on January 13th. Or maybe Debbie is conflating a few different days. The question with Debbie is whether to disregard her statements and testimony about January 13th entirely or whether they can tell us something about a tragedy. Another question is whether the Woodlawn schedule tells us anything else about January 13, 1999. 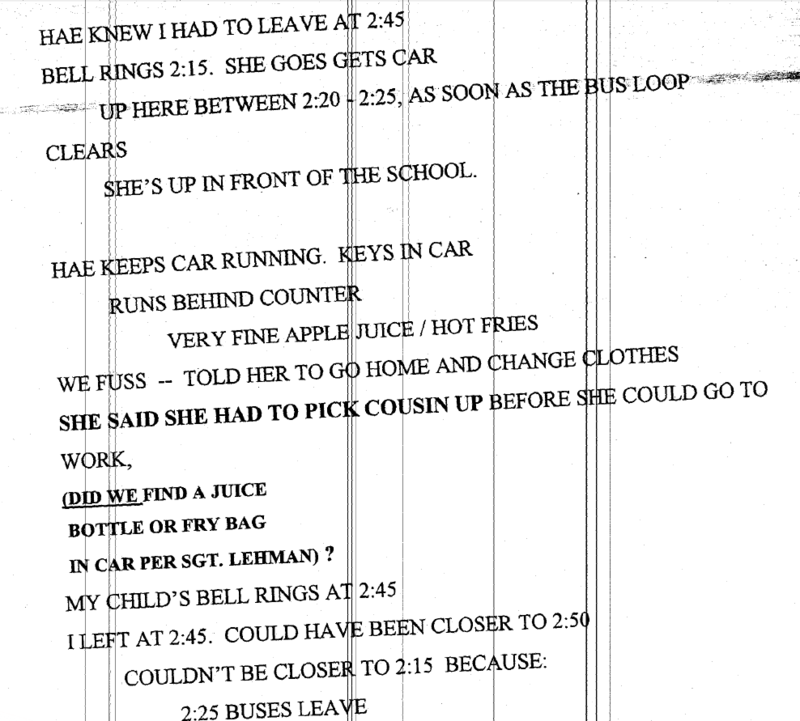 One interesting thought is that Becky has said that there was talk during "A" Lunch (from 10:40-11:10) of Hae giving Adnan a ride after school, with Becky saying she sat next to Hae and heard that Hae giving Adnan a ride after school would be "no problem." This was presumably followed by Hae's own free period from 11:10-12:55, followed by the A.P. Psychology class that Adnan, Hae, Becky, and Aisha took together from 12:55-2:15. We know that Adnan was late to this class, possibly because he was picking up his recommendation letter. If, like me, you believe that something came up for Hae that caused her to turn Adnan down for a ride at the end of school because she had somewhere to be after school and "something else" to do, this "something else" almost certainly came up during Hae's free period or during A.P. Psychology. It seems unlikely that this "something" came up during class itself, especially because Becky and Aisha were in that class and seemingly have no recollection of anything significant happening during class. So, that leaves us with Hae's free period between 11:10 and 12:55. If you believe that Hae ultimately gave Adnan a ride after turning him down, this period of time is somewhat irrelevant. ** But if you believe that "something else" prevented Hae from giving Adnan a ride, this "something else" likely arose during this one hour and forty-five minute period of time. *Did Asia read this article before sending her first letter to Adnan on March 1st? Previously, I was operating under the assumption that Asia had no idea when the State was claiming that Hae was killed. If Asia had read or heard of this article, however, it puts things in a slightly different perspective. 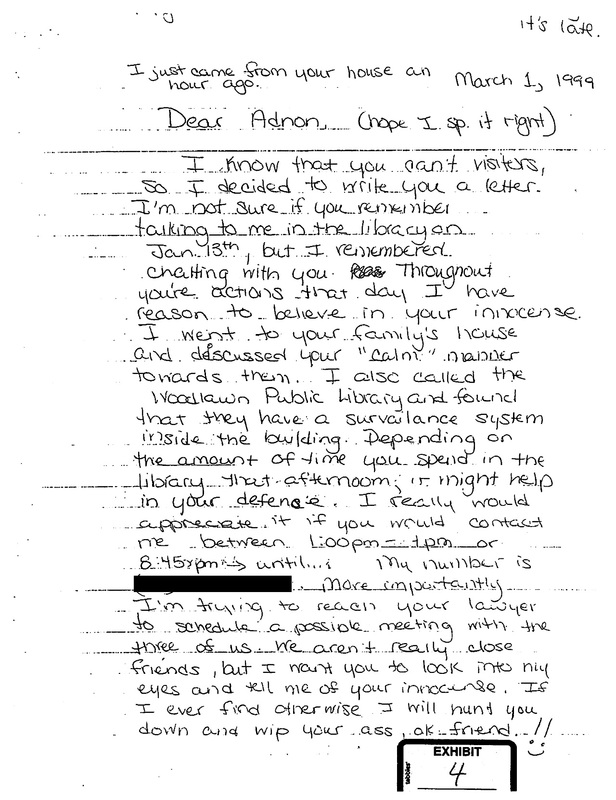 In Asia's first letter, she notes the presence of the surveillance system in the library and how it might help Adnan depending on the amount of time that he spent in the library on the afternoon of January 13th. If Asia saw Adnan until 2:40 and knew that the State was claiming that Hae was killed after 3:00, that makes her comment make a lot of sense. If Adnan stayed for a while at the library, the surveillance video could help him. If he left soon after Asia left, the video wouldn't help him. **Of course, if the "something else" involved someone else, you have to wonder why that someone else apparently never came forward to say that he or she had plans with Hae on the afternoon of January 13th. Do you know if Adnan was at school on Thursday Feb 7, 1999? On the 8th school was cancelled for the first snow day of the year. I think anyone suggesting that Adnan asked Hae for a ride front of other people is pretty good evidence that he could not have made any plan to kill someone. The problem for the Adnan is guilty crowd is they can't make up their mind if Adnan is a criminal genius, or really stupid. For the narrative they want to give, he would have to be dumber than a bunch of rocks. Then after he murders her, he is going to keep her car all evening long and drive it around stoned, without worrying that the police are looking for her car? Pretty proposterous. So after reading through these accounts, it seems like Becky's story doesn't add up with the theory that the "something" came up during Hae's free period (before Psych class). Adnan, Hae, Becky, and Aisha are in Psych class together when the bell rings. If Hae already knows she can't give Adnan a ride, why doesn't she tell him then? If she just leaves the room and heads to her car, how does she know she'll see him to tell him she can't do it now? And wouldn't Adnan check in with her to see where/when they would meet up if he's not planning on just walking with her until they both get to her car? How does it happen that Adnan and Hae go their separate ways, but a few minutes later Becky spots them in the hall going OPPOSITE directions and that's when Hae says she can't drive him? Is it possible that Hae didn't learn about the "something" else until after the last class? Maybe she had a page that she couldn't check during school, or went to her car to wait for Adnan but spoke to someone there. Then, if Adnan had previously said something like "I gotta go to the guidance office first, then I'll meet you at your car", she goes back into school to find him and tell him sorry she can't now. That would explain why that exchange happened in the hallway the way Becky describes. theghostoftomlandery: It's a good question. Obviously Adnan being in school in 1/5 helps the theory that Debbie is remembering 1/5. Meanwhile, Adnan being in school on 1/7 makes it possible that Asia is remembering 1/7. hooville: Yes, I'm firmly convinced that Adnan did not plan to kill Hae when he asked for the ride, regardless of whether he is guilty or innocent. Dan: Interesting, I suppose it's possible that the "something" came up right after school. Of course, keep in mind that Adnan was late to the Psychology class, so it's possible that Hae didn't get to talk to him until after class. Also, it's possible that Hae mentioned the "something else" both in class and when she was leaving. Thanks for the response. Sarah apparently had access to his attendance record for that week and Rabia has all of the same documentation. Have you asked for this information? It's possible that HML just didn't want to give Adnan a ride and that the "something else to do" was simply an excuse and not a real event at all. Wouldn't Debbie's statement be possibly proved by whether the guidence counsellor had given her a recommendation on the same day as Adnan? theghostoftomlandry: I haven't asked Rabia for anything beyond the trial transcripts. Badger: It certainly could be an excuse as opposed to an actual "something else" to do. Louise: Yes, Debbie could certainly have some evidence that could confirm or dispel her seeing the guidance counselor on 1/13, but I'm not aware of anybody being in contact with Debbie. If I remember correctly, she wasn't even interviewed for the podcast, right? Did classes follow the same schedule Monday through Friday? Based on the number and length of the blocks (~1.25 hrs each; only three instructional blocks), I'd almost assume this was a Tuesday / Thursday schedule. Also, wow, Woodlawn's day is relatively short -- IIRC, my high school started around the same time (maybe 15 minutes earlier?) and ended about an hour later. Not sure if you already took this into account when conducting your analysis. 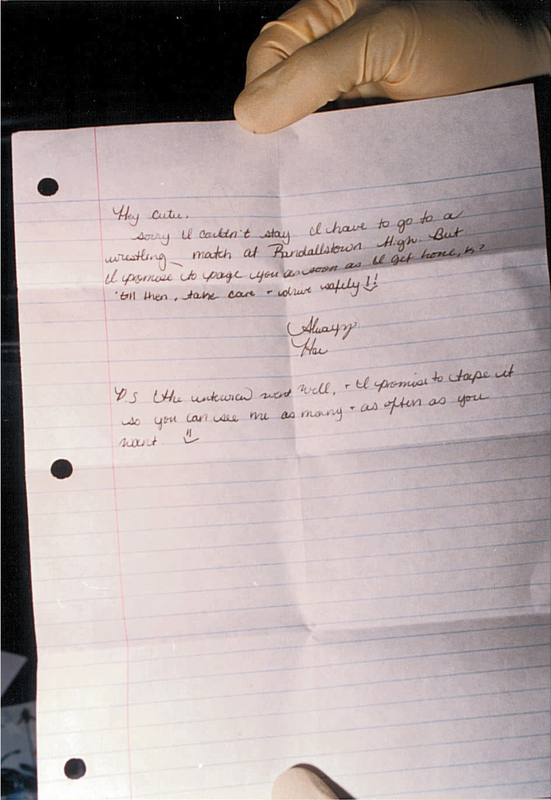 But, perhaps this gives credence to the idea that Debbie misremembered the time she saw Adnan, since he is placing this trip closer to the 1:13 time stamp on the letter. Or, he did end up making two trips to the office, one before school and one after. Always enjoy reading your insights. The time you spend on them is appreciated! This is another reason to think Debbie might be mistaken (unless Adnan made 2 trips to the guidance counselor's office on 1/13). If Debbie can't remember when school let out, can any of her testimony be trusted? I think you might be conflating the two pieces of evidence provided by Debbie - During the trial, Debbie stands by her statement of seeing Hae at 3:00 on the 13th: For example, on cross "Q: And you recall that you told him [Det. O'Shea] like you told us yesterday that you saw Hae at about three o'clock? A: Yes."). Your post today and in prior posts state that "Debbie didn't stand by her statements" and "Given that Debbie didn't stand by her police statement(s) at trial . . . ." Didn't Debbie concede in the police interview that she could have the wrong day in terms of seeing Adnan but she did stand by her statement of seeing Hae during the police interviews and during the trials under direct and cross? I double-checked: during direct by Murphy on Feb 16 at transcript page 302 (pdf page 72) as well as under cross on Feb 17, Debbie confirms her statement regading see Hae on the 13th. Nine9fifty50: I'll have to go back and check Debbie's testimony. The overall sense that I got from her testimony is that she wasn't standing by her statements, which is why the prosecution didn't (and didn't have to) use her during closing when it claimed Hae was dead by 2:36 and the Court of Special Appeals was able to conclude that Hae was last seen at about 2:30. You mentioned Adnan being late for a class and that possibly he was at the guidance counselors office. Can you elaborate on that? I have always found Adnan's tardiness curious, especially since it was after he was hanging out with Jay. Previously I had thought they ran late after buying drugs in the midday, but a trip to the guidance counselor is a more benign explanation. Rich: The note by Adnan's attorney indicates that Adnan is unclear how long he was with Jay and that he was "in school at 1:13 because [the guidance counselor] printed out his recommendation letter." lists the visit to the guidance counselor's office as occurring during A.P. Psychology class. So, my best guess is that Adnan was back at school by at least 1:13, which is when he picked up his letter. When exactly did he arrive back at school? I don't know. Is it possible he didn't pick up the letter at 1:13? Sure. Is it possible he made multiple trips to the guidance counselor's office? Sure. I feel like this is something that will remain a question mark.